The increasingly heated dispute over place names in Israel underlies a much greater political struggle, the BBC's Yolande Knell explains from Jerusalem. "Where are you going?" asked the friendly, but slightly over-familiar, Jewish-Israeli boy sitting next to me on the plane from London. "I work in Jerusalem," I replied. His smile instantly turned to a scowl. "It's not Jerusalem," he said. "It's Yerushalayim". "That's in Hebrew, but in English we say Jerusalem," I protested and I was about to add - somewhat mischievously - that my Palestinian friends refer to it as "al-Quds" - the Arabic name for the city. But at that point, the boy's little sister spilled orange juice over his lap. Our conversation was cut short. Land may be at the heart of the Palestinian-Israeli conflict but every day the struggle to control the historical narrative is played out most tangibly in language. Place names are the most obvious example. If some prominent politicians on the Israeli right have their way, then in future the road signs here will only point to "Yerushalayim". Image caption Leading Israeli politicians argue the Jewish heritage of Jerusalem should be fully recognised. A proposal to have all signs displaying just the transliterations of Hebrew names of cities and towns is being considered by a new ministerial committee. There is strong opposition among Israel's population of more than one million Arab-Israelis but also from members of the Government Names Committee. These independent experts have been responsible for selecting place names since the 1950s - not long after the creation of the state of Israel. They argue that changing the system will confuse tourists. But others believe that complete Judaisation of the map is long overdue. At 32, Tzipi Hotovely is the youngest member of the Israeli parliament. A well-qualified lawyer and religious right-winger, she is also seen as the ideological voice and rising star of the prime minister's Likud party. She finds it unacceptable that although Hebrew names were given to Jerusalem neighbourhoods years ago, many Arabic ones have stuck. For example, while the names of streets around the prime minister's residence read like an A to Z of Zionism, the upscale area itself is still called by its original Arabic name "Talbiya" - instead of "Komemiyut" or "Independence" - its given Hebrew name. The same goes for Bakah and Malha, alias Geulim and Manahat. Ms Hotovely has introduced a bill that would require different neighbourhoods to be identified by their Hebrew names only - on signposts, official documents and in state media. She sees it as part of the wider battle for Jerusalem - which both Israelis and Palestinians claim as their capital. Names are "very powerful symbols" she tells me. The biggest problems arise in East Jerusalem - which was occupied by Israel in 1967 and is still a mainly Arab area - although Jewish settlers are fast moving in, taking over Palestinian homes. Ms Hotovely wants the names of its quarters changed too. "Most places in the east side of Jerusalem are part of our biblical heritage. It is very important to know the cultural history. 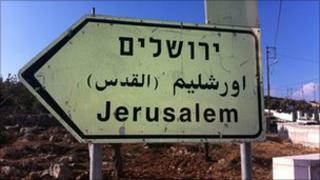 The city was founded by David the King and many neighbourhoods are originally Jewish neighbourhoods," she says. For Huda Imam, a well-known, energetic Palestinian activist born in the Sheikh Jarrah area of East Jerusalem, such pronouncements are worrying. Already she says she sees more and more signs for Shimon HaTzedik instead of Sheikh Jarrah. The Hebrew name indicates the tomb is thought to belong to an ancient Jewish priest while the Arabic derives from the surgeon of the 12th Century Muslim leader, Saladin. Huda points out the landmarks that suggest her neighbourhood's vibrant Arab history. Image caption Palestinian activists in Sheikh Jarrah protest by the house of an Arab family taken over by settlers. Many recent ones are tinged with a sense of loss like the Hind al-Husseini orphan school, Orient House, once the Jerusalem headquarters for Palestinian officials, and the Shepherd Hotel, demolished in January. On the hillside there is also the green-shuttered house that Huda's own father built and which, she says, the Israeli authorities confiscated and later sold. She feels that Israel is abandoning hopes of peaceful co-existence. "I don't want to say they're succeeding because I'm still here," she adds. "But it's destroying any trust. They're erasing all traces of Palestinian identity." There are many Palestinians and some Jewish Israelis trying to stop that from happening. On Fridays, they organise noisy demonstrations on the streets in Sheikh Jarrah. Often there are scuffles with settlers, both sides asserting their competing claims. The continuing fight for the rights to Jerusalem, and all the holy land, takes many forms.